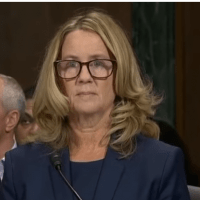 (Beth Baumann – Townhall) Late Tuesday night Fox News received a copy of a letter from one of Dr. Christine Blasey Ford’s ex-boyfriends who claims Ford has experience coaching her former roommate on polygraph tests, which contradicts Ford’s testimony under oath. The ex-boyfriend, who was in a serious relationship with Ford during the 90s, said Ford never talked about a sexual assault or appeared to be afraid of flying. I, [redacted], am a current resident of [redacted], California. I first met Christine Blasey (now Dr. Christine Blasey Ford) in 1989 or 1990 in California. From 1990-91, I was just friends with Ford. From approximately 1992 to 1998, I was in a relationship with Dr. Ford. I found her truthful and maintain no animus towards her.